Another royal christening took place on Saturday April 23. The Queen’s first great-grandchild was born on December 29 2010 to Peter Phillips, son of Princess Anne, and his Canadian-born wife, Autumn Phillips. 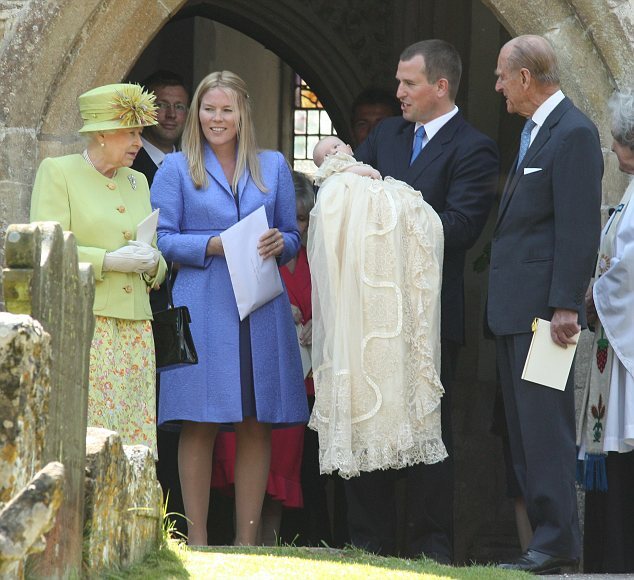 The names of royal babies are not usually made known to the public until they are christened, but at a church service on January 2 2011, the rector welcomed Peter and Autumn Phillips and their daughter Savannah, and offered a prayer for them. Savannah Phillips’ christening was held at the Church of the Holy Cross at Avening in Gloucestershire, near the home of Princess Anne. Baby Savannah is 12th in line to the throne. Savannah isn’t a common name in the United Kingdom, and is unique to the royal family. It is, however, a Top 100 name in the United States and in Canada, the land of Autumn Phillips’ birth. Perhaps now this transatlantic name will become more popular in Britain. It’s a Top 100 name in Australia too, so we might have got a jump on this newly-royal name. UPDATE: Savannah’s full name is Savannah Anne Kathleen – her middle names are after both her grandmothers. Imagine if she ends up on the throne! Queen Savannah… I can’t quite picture it. I think she was only allowed to have such a modern name because she’s so far from the throne. Rumour has it that the queen has a lot of input into the names of royal babies who have a good chance of being monarchs. It’s also said the queen didn’t like the name Savannah, but didn’t worry about it because the chances of Savannah becoming queen are tiny.